Hey everyone! I’m knee-deep in decluttering/fixing up mode as we get ready to list our home (and may have cried three times today when I got to various difficult things– baby shoes and memory boxes being one of them!) so I’ll keep this short and sweet. And I’ll try not to cry about it again. 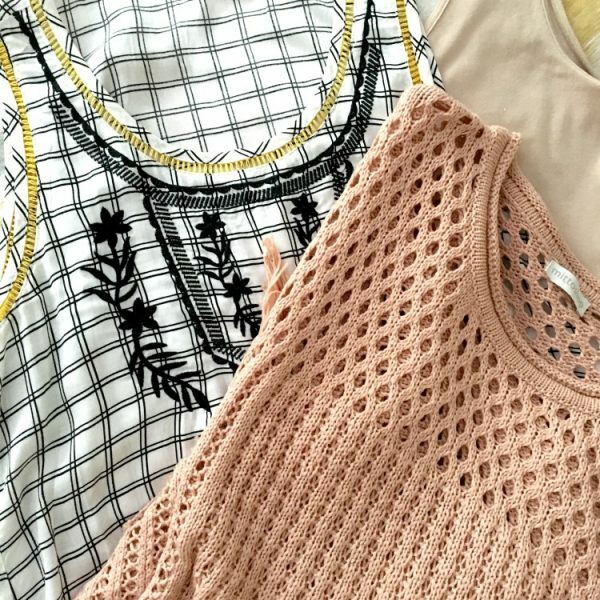 But I need your help in deciding which items to keep from my latest Stitch Fix and it’s due at the post office on Saturday, eeek! 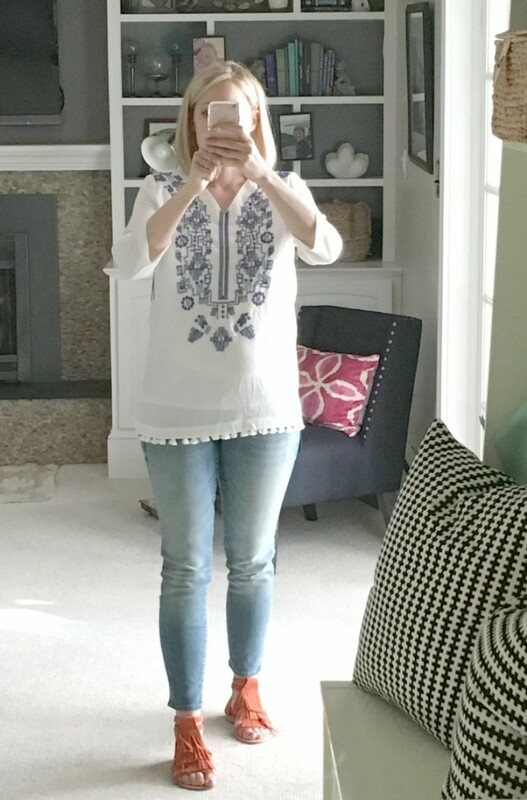 Plus I finally tried the shoes even though I was skeptical, and would love your thoughts on those as well. 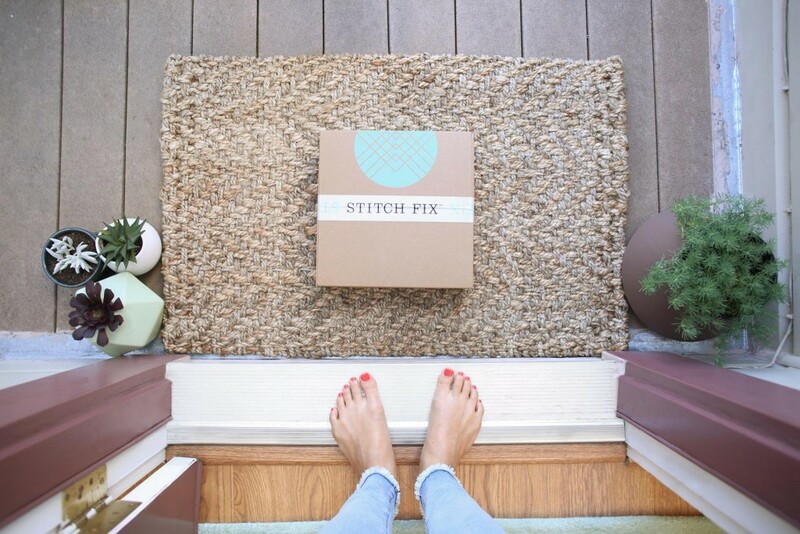 For those hearing about it for the first time, Stitch Fix is a personal styling service. You pay a small fee to have a stylist pick out five pieces according to your needs/wants/specifications and send them to you, and then if you keep any of the pieces that fee is applied to the balance! Plus if you keep every piece, you get 25% off the entire box. They make it super easy by including a postage-paid envelope so you can return whatever you don’t want quickly and easily. This is my 4th Fix, so let’s get to it! My stylist really nailed my style again. That said, not everything worked and I really need help deciding on the last two pieces! I’ve included screenshots with the full name and price of each piece below. When you see the prices, keep in mind that I chose the higher end of the price spectrum (you get to choose your price limit) because I feel you get more unique pieces that way, and personally I’d rather have one item I love than five I only kinda like. You can go lower or higher on the pricing when you sign up, and change it as you go. 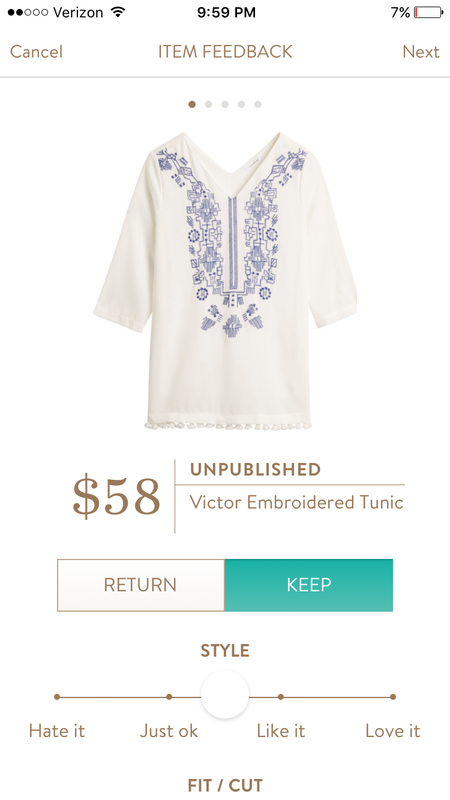 First up was the Victor Embroidered tunic. And also my phone was low on battery when I screenshotted it, in case you were wondering. I was very excited to see this in my fix, however when it arrived I knew it would be a miss. It’s lined, which made it a little fussy and the fit was off. It fell across my hips, so accentuated the widest part of my body. And also I need to learn to do this without covering my face. HOWEVER. I adore the embroidery and tassels, and this is my style, so I’m sending it back with a sad face. Up next was the Skies are Blue Keiko Crochet Neckline Knit Top that I was thrilled to see when I peeked because it’s bright, the perfect cut, and has a little extra enhancement around the neckline. Now, THE SHOES. 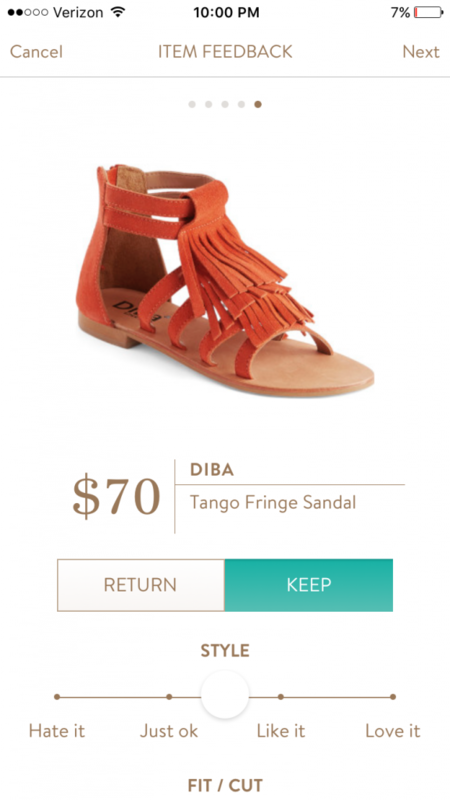 Shoes are a new offering at Stitch Fix, which makes sense because they do help complete the outfit. I’ll admit I was skeptical to try them because my feet are wide and it’s hard to find shoes that fit, but gave it a try anyways and pinned similar styles to my Fashion board (which their stylists use to help choose pieces for your fix). These shoes were killer and I loved them when I pulled them out of the box. Here’s where I need your help. The two pieces I didn’t think I’d love, I actually really like! Not sure if it’s enough to keep them, though? What do you think? 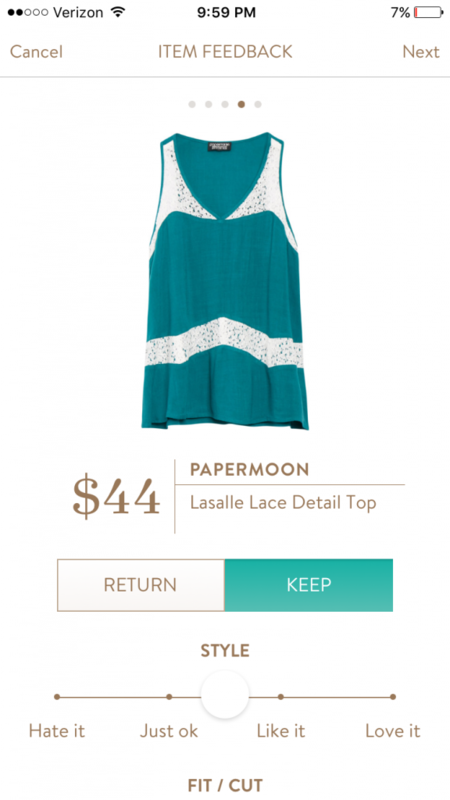 First was the Papermoon Lasalle Lace Detail tank top. I thought my bra would show through the lace on the straps, but turns out that’s not a problem. I can use my handy bra clips to hide the straps in the back (not doing that here, I was too lazy). It’s shorter than I usually wear, what do you think? 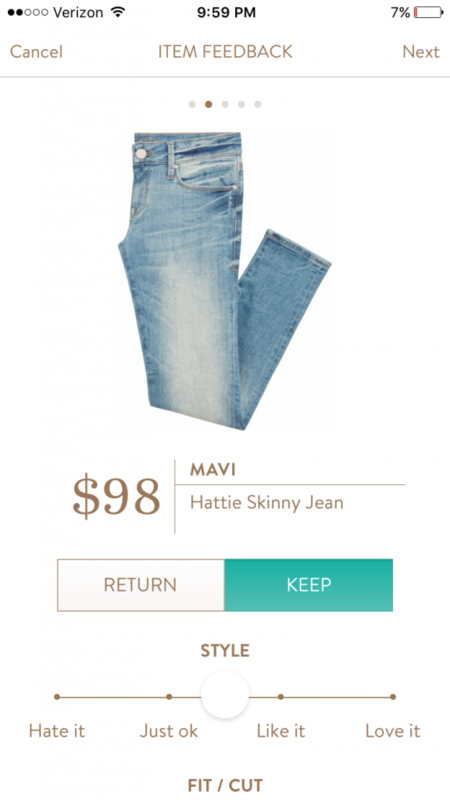 Last but not least, the Mavi Hattie Skinny Jeans. 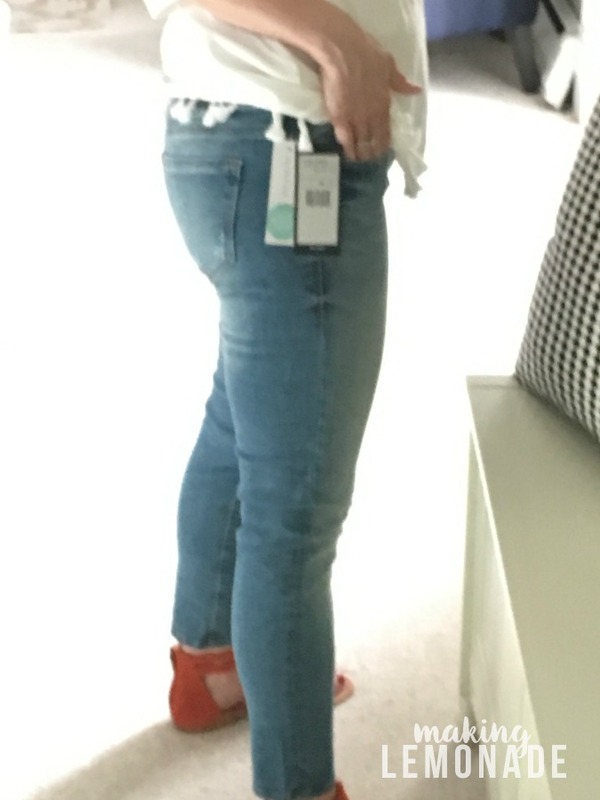 After loving the jeans in my last fix, I requested another exact pair but they sent these instead. They are low-rise, which doesn’t work for this ‘two c-sections in under two years and one was a STAT c-section plus I just ate cheese’ kind of girl. However I was pleasantly surprised when I tried them on, I kinda really love them! But they do have a muffin-top effect. I’m wondering if that’s a deal breaker or if I can squeeze myself into a Spanx tank and solve that little issue. STATUS: UNSURE… what do you think?! These are a size 28 and fit like perfection everywhere else, it’s just that low rise issue, EEK! Not sure what to do? Here the tunic is covering my muffin top (cheese top?) nicely. So this Fix is probably going to be a 2/5, which in all actuality is pretty dang good! I’m super picky so even finding one piece I love is a homerun for me. 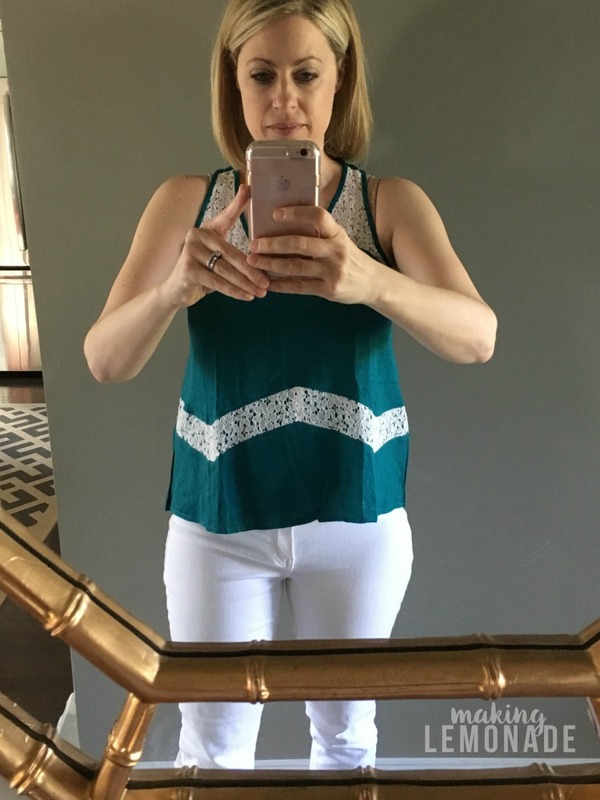 What do you think on the green tank and jeans? Are they a little two casual? Would I be crazy to send those shoes back? Help, wise ones! 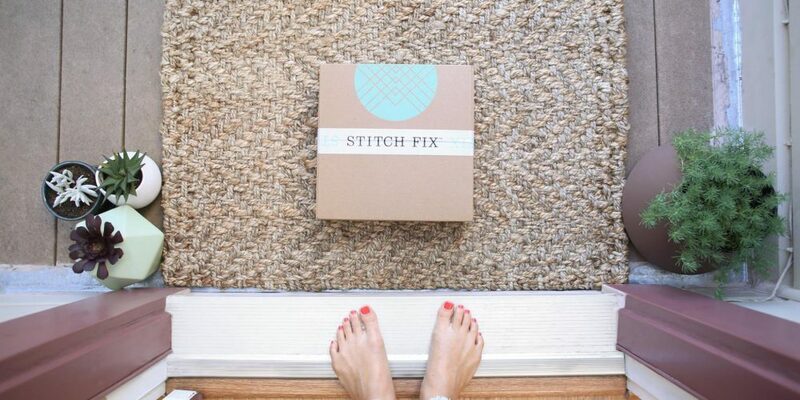 PS- have you tried Stitch Fix yet? 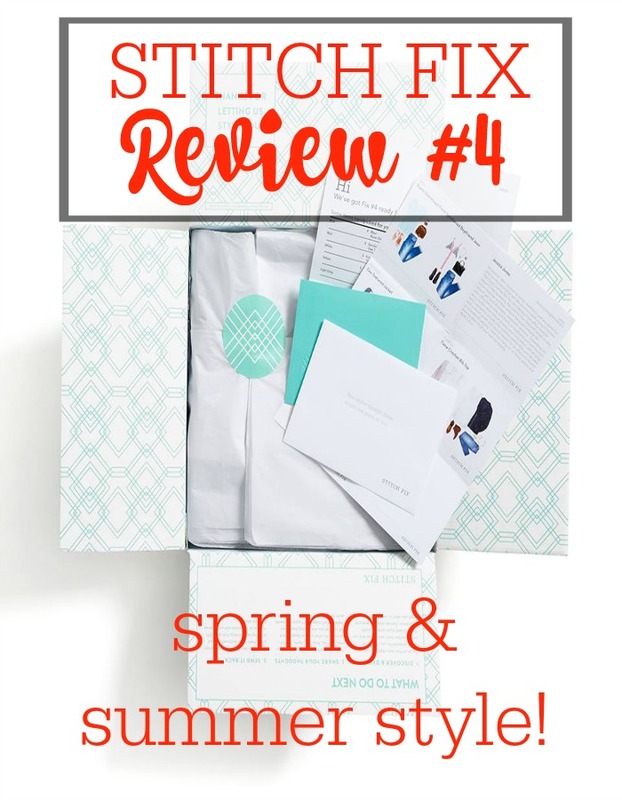 If you want to give it a try and sign up through my link let me know– I’ll add you to the Stitch Fix group I’m in! It’s really helpful to get tips and see what others are getting (and request them for yourself in your Fix). Plus if you refer a friend and they sign up, you get a $25 credit too. Free clothes! The question remains… will I get a Fix #5? Yes. I’m having a lot of fun with this, and think I’m going to request an ‘all tops’ Fix next month. 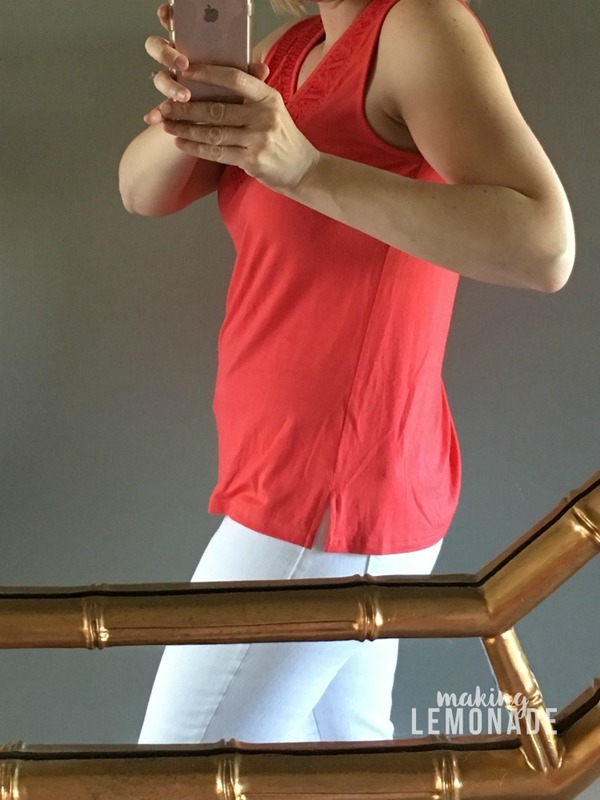 Not sure if they’ll do it, but I love the tops I’m seeing in the Facebook groups and really as long as I have a few core pairs of jeans can rotate in fun tops to change up the look. What do you think? Keep, return? 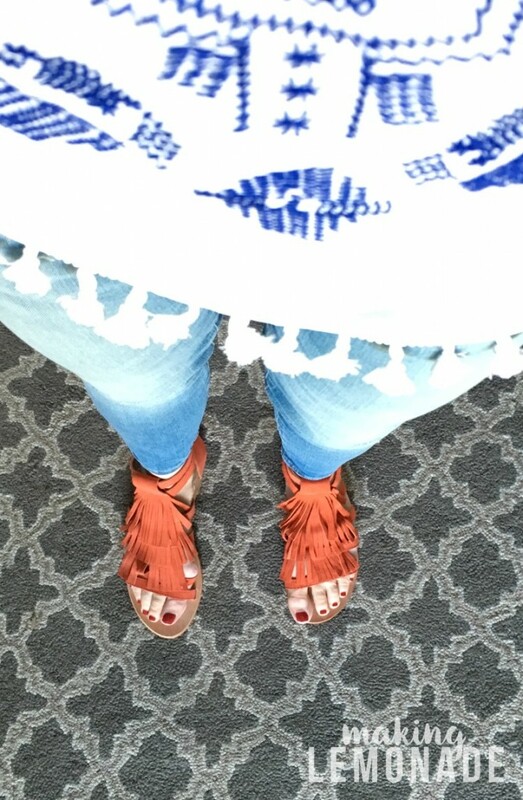 Do you like the boho look for summer or is there another style you prefer? next post: DIY Ideas for Items You Can Find in ANY Thrift Store! My experience with lowrise/muffin top issue is that whenever I think “everything else is great so I’ll get them” I usually regret it. When you spend that price on jeans, you want to know you’ll wear them out, not constantly end up putting them back in the closet because they “just don’t work with this outfit”. It’s hard to say no to an almost perfect piece of clothing, but if it’s not perfect, you’re going to feel bad wearing it. I don’t elieve in keeping anything if there is even one con. Unless you are 100% happy about the item return it. Ayou will most-like find it haning in your closet and wish you had returned the item, rather than wasting your money something you don’t like or doesn’t fit you properly. I is just the length that can be changed, and you really like it, and you will wear it more than 6 times, by all means keep it. If an item doesn’t fit properly, especially if it is too tight, or too short there is nothing you can do about it, then send it back, and wait until you find one which fits properly and there are no cons and use the money to purchase that item. Buying something that will never be worn or you are going to wear only once doesn’t make any sense, not to mention the money you wasted. Clothes are too trendy, come in and out fof style too fast to waste money on. Choos clothes you will get plenty of wear out of. Many times I purchase or make something very plain and then wear accessories to add embelishments. I had purched a very plain two piece pants outfit for my daughter on sale for $2.00 and took it home and hand embrodered up the outside of both legs and around the scoop neck line to match the design on the legs. I was in an exclusive childrens dress shop and I was asked to sell the infit to another customer for $125.00. When Christina out grew the outfit the next year I passed it down to my sister’s two daughters. I used to do hand smocking also when I made my daughter’s clothes and I was offered much more than what the person could buy something very similar in an exclusive childrens ress shop. I always thught these people who wanted to buy my daughter’s clothes right off her body appreciates knowing the embelishements were done by hand and not by any machine. When you purchase from a sore, you have no clue how those clothes (especially the embellishments) were applied. I am pretty sure the tunic with blue stitching was done by machine. If you really like that tunic, inquire if you can get it in the next size up. As for the pumpkin coored tunic top, I really do like the top and back crochet embellishment, but again, if you can get it in the next size up, and you really do like it, by all meas, exchange it for the next size up. As for the jeans, ask if they have them with a higher waist line. The sandals are adorable, if they fit you. First, if the shoes are not wearable for a day of walking around a lot, forget them. They are adorable, but you know better. That one top with white lace in between the blue is too short and accentuates you in the wrong place. Sorry. If you need to eat cheese, then you don’t want something hugging your middle. FYI…you are totally adorable and your figure is perfect. You are brave to shop in the mail. Have you ever looked at Merrill sandals? They are pricey, but last and are always my favorite in warm weather. They have cute styles too. You can’t go wrong with them. If you need another pair of jeans, keep them. If not , send them back. 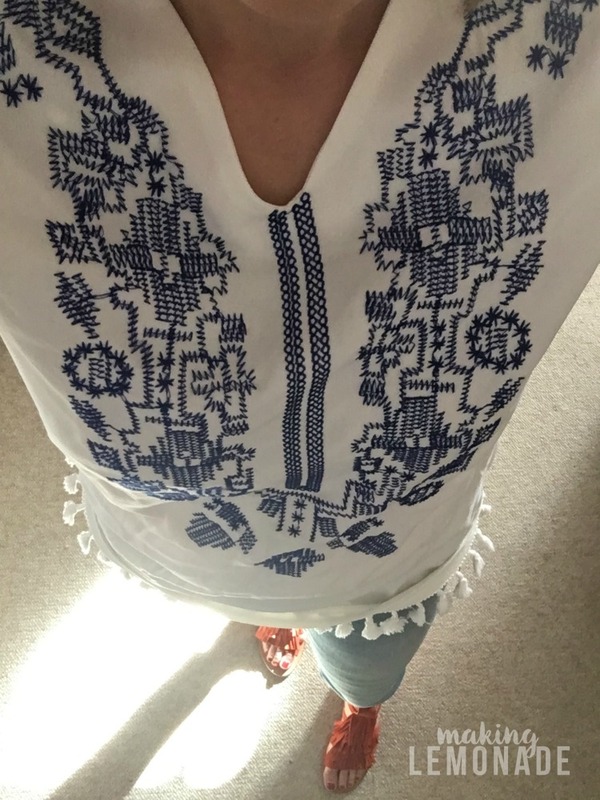 I like the boho look but you don’t have to hide your shape – flaunt it! 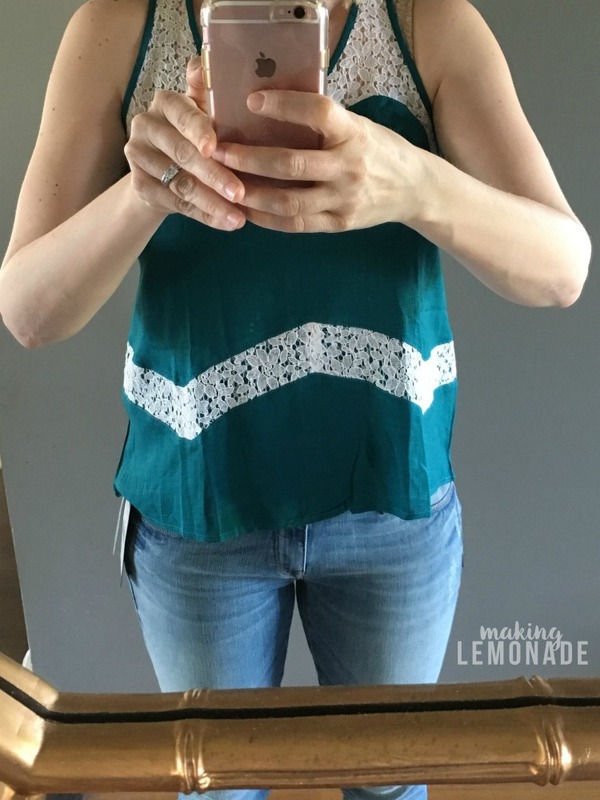 My feeling is that the top is too short to be super cute, and the pockets of the jeans sit too low on your rear to be flattering. The shoes are kind of over-the-top. I would return them all. I am a costumer so dress many people for deferent rolls for short periods of time. My rule of thumb for buying, is if it isn’t perfect forget it, I agree with another comment you have a great figure, relax, but though I love the color it isn’t the most flattering length. Also I am allergic to fructose. Totally get the cheese problem. The shoes will not go with a lot of outfits due to color and if not amazingly comfortable; forget them. They are cute just not totally practical, but not everything must be. Hi Carrie, i really enjoy your blog. It is informative and fun. 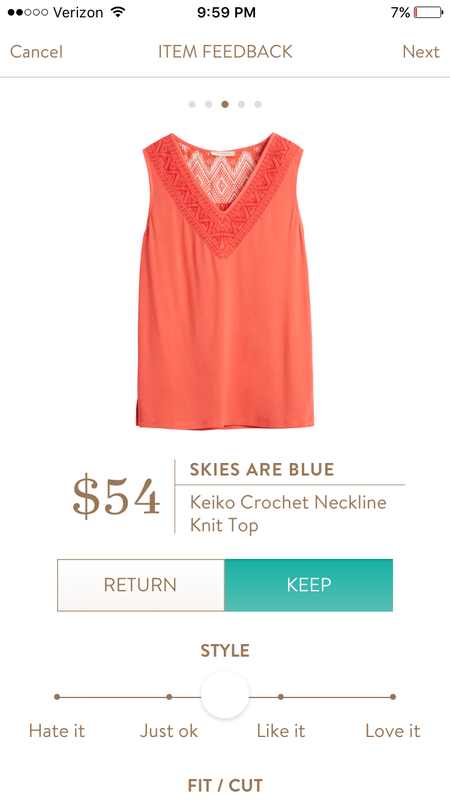 This stitch fix box seems like a lot of fun, too, and i enjoy reading those posts. I’m just going to make a comment. 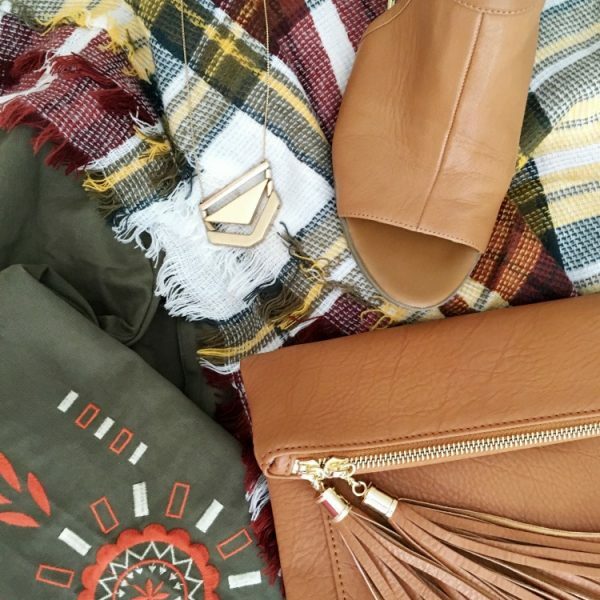 (Not a critique): in the spirit of decluttering and the konmari method, in which you value, in my opinion, the stitch fix box seems to add to clothes clutter. Albeit one keeps the pieces one wants, however, it is still tempting to keep certain things that one wouldnt have even purchased at the store perhaps, but now it has found itself in one’s living room. In this age of consumerism and over abundance, if we decide we need a tunic (ie. that it is sorely missing from our closets) then we should shop for that piece. Again this is in the spirit of avoiding clothes clutter (and /or ensuring one piece leaves the closet to replace the new). I think this stitch fix box has a place for certain people that dont have time to shop or need help from stylist, however, the essence of it is counter intuitive to the decluttering theme, in my opinion. Best wishes. The blue top is cute but too short. And if you’re anything like me you are going to be constantly tugging those jeans up and/or pulling your shirt down to make sure your crack isn’t showing! Low-rise is the pits. I don’t know why people are even making it anymore! Unless you’re 17, it’s just not flattering.